Chassis and Engine Dynos. Is your car achieving its maximum performance? Bring it to JBA for Dyno Tuning to find out! If you can’t get rid of that off-idle stumble, or if your factory EFI computer can’t handle a cold air intake or new gears without a hiccup, look to the professionals at JBA Speed Shop to assist you with custom dyno tuning services. JBA houses a 160-mph Dyno Dynamics chassis dyno as well as a 2500-hp DTS engine dyno to help you get the most performance out of your engine either before or after it is bolted in. JBA Speed Shop has dyno’d and tuned thousands of vehicles, from carbureted muscle cars, hot rods and race cars…to late-model cars and trucks with factory EFI or standalone engine management systems such as DFI, Emerald, FAST, MegaSquirt, Holley Commander and Edelbrock Pro-Jection. Naturally aspirated, supercharged, turbo’d or nitrous-enhanced! Whether you just want to calibrate your speedometer, verify your horsepower and torque, or custom tune your ride for optimum drivability and power, JBA has got you covered. As one of the founding SCT dealers, JBA offers 4-bank Eliminator chips for OBD I late-model Fords and XCalibrator flash tuners for OBD II vehicles. JBA Speed Shop proudly uses "state of the art" Mustang Dyno MD-500 and Dyno Dynamics load-bearing eddy-current Chassis Dynamometers. Results are weather-corrected and the dyno reliably handles everything from a 50-hp grocery getter to a 1,000 hp racecar! For every power verification, you receive a color graph that charts your hp and torque curves, along with a printout that includes mph, rpm, hp, torque, ambient temp, air/fuel ratio and vacuum/boost readings throughout the rpm band. 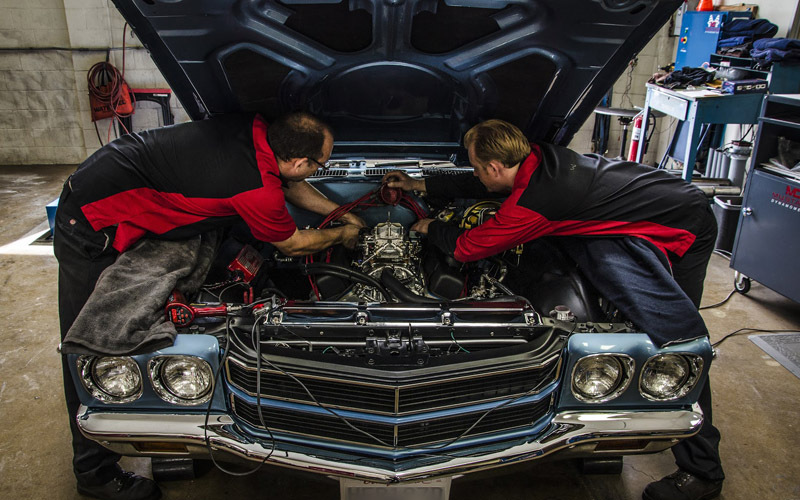 Our technicians have experience in two very different worlds. On the one hand, they have years of modifying carburetors and distributors to achieve optimum results, while on the other hand they have to understand modern electronic fuel injection including its various sensors and strategies. Over the years, we’ve developed a number of procedures that we perform prior to beginning tuning. The procedures vary depending on if the vehicle is carbureted, OBD-I or OBD-II, but generally includes items such as road test and evaluation for power and drivability, verification of engine oil level, engine compartment inspection and leak check, identification of diagnostic trouble codes if any, rear tire inspection and inflation verification, engine ignition timing and fuel pressure check, throttle position sensor adjustment, verifying proper supercharger installation, and the suitability of spark plug heat range and gap by application. Ultimately, customer satisfaction is our number one goal. Contact one of our service writers at 858-495-3395 to schedule an appointment or for more information. 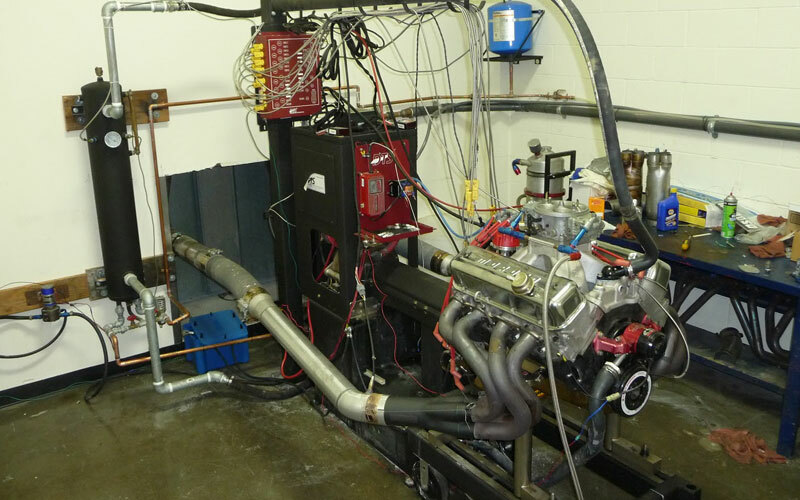 JBA’s full service engine shop features a state-of-the-art DTS Powermark engine dyno. Designed to handle up to 2,500-hp and 1,800-ft/lbs of torque, our dyno facility provides advanced high performance engine dyno testing and tuning for street performance, drag, circle track, road racing, off-road and marine race engines. JBA’s dyno cell is designed and manufactured for maximum performance and durability, as well as unequalled data acquisition capabilities. The data acquisition is computer controlled with all critical engine functions monitored, including air/fuel ratio, exhaust gas temperatures and brake specific fuel consumption. JBA’s engine dyno cell and trained staff are available for half-day, full-day, or weekly rentals. Contact our engine services manager at 858-495-3395 to book time or for more information.